Use this link to view this email as a web page. The American Goat Federation was created specifically to represent, unify, improve and advance the American goat industry and assist producers to achieve maximum success. The American Goat Federation (AGF) seeks to actively represent the interests of more than 150 organizations and thousands of producers engaged in the sustainable production and marketing of goat milk, meat, fiber, breeding stock and grazing services across the United States. A tattoo is permanent, so be certain you have correctly identified the goat before marking. Use a trimming stand to hold the goat secure. 1. Cleanse the ear with alcohol or alcohol wipes. 2. Apply the ink. We like the green roll-on. 3. Situate the tattoo pliers over the ink (photo above shows our PermaMark 3/8" tattooer) and apply gentle but firm pressure (the goat will act like it is torture). Too much pressure on really thin ears tends to cause bleeding. 4. Rub baking soda on the tattooed area. This helps stop the bleeding and helps keep the tattoo clean while healing. Can also use Blood Stop Powder. Best maggot, screwworm and ear-tick spray for livestock and horses. Kills and repels face flies. This works quickly! Used as both preventative and treatment on our farms during ear tagging or if we come across an animal with fly-strike. 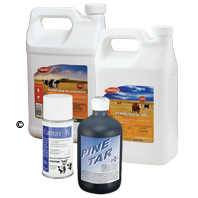 There is a can of Catron IV in every barn and on most of our farm vehicles as well. Control flies and lice. Use as pour-on, spray or via a back rubber. Pour-on insecticide. Controls lice and flies. Repels flies and biting insects. Apply to wounds. Effects last a week. 16 oz squeeze bottle with flip-top nozzle cap for precise application. We depend on this product! 1. Separate a whole (slaughtered) goat into fore legs, hind legs and backstrap. 2. Remove as much fat as possible (helpful if carcass has been in the freezer for several hours). 3. Cover liberally with Garland Jacks Secret 6 Barbecue Sauce (Hickory Spice) or any favorite BBQ sauce. Marinate for 8 hours. 4. Add another bottle of sauce to the meat. Place meat with sauce in roasting pan. 5. Cook at 325° for 4 hours. 6. Ladle juices over top of meat and turn heat down to 200° and roast 3 hours more. Turn off and cool for an hour. 7. Drain juices (save) and pull the meat off the bone. Return to roaster at 300° for another two hours. Continue to ladle with juices. 8. 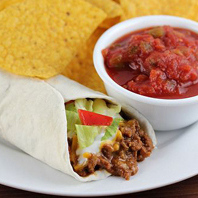 Place meat into tortillas. Cover in cheese, salsa and your preferred toppings. Brenda and her goat are ramping up for show season. With summer comes the start of fair and show season. 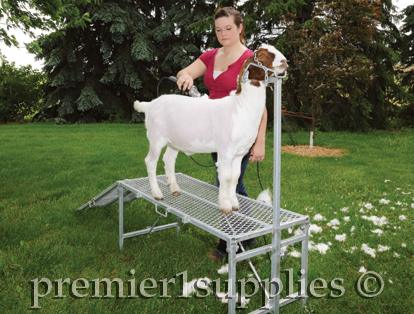 Sara McArtor (Premier Product Consultant) offered the following tips on readying goats for the show. 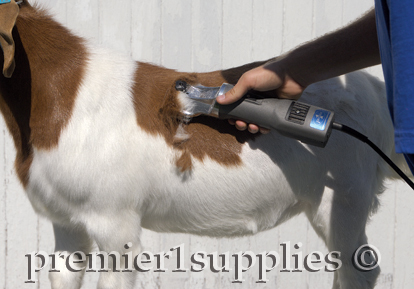 • Make sure your clippers, blades, hoof trimmers, lead chains and leads are clean and in good working order. • Have your washing products stocked and ready to go. Soaps formulated for show animals work best. Do not use a dishwashing soap that fights grease, because this will strip the oils from the animal's hair. • Clip and trim hoofs about a week before the show. This will give time for them to grow out a little and look more natural. • Work with the animal. Taking a goat that has never been walked into the show ring is no fun for you or the animal. • Every person showing animals has a trick or two to get the goat ready for a show. If you are just starting out, go to a few shows and talk to the folks who are showing. Many are more than happy to talk about their animals and how they get them ready for the show. • When hauling livestock to a show, make sure the trailer is clean and has side protection, which helps prevent the animals getting sick from cold and wind. • Familiarize yourself with the rules and regulations of the show you're attending. This info can usually be found on the show's website. • Before the show, look online for info about the judges to find their likes and dislikes in a goat. Every judge has their own idea of what is an awesome goat. If you don't place well at one show, you might at another. For example—we were at a show that held multiple competitions throughout one weekend. On Saturday we placed 3rd, but we won the Jackpot with the same goat on Sunday (different judges). Moral of the story? Never give up! 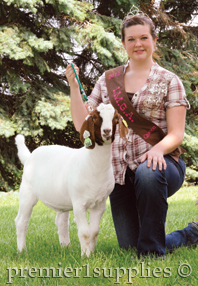 The 2012-13 IMGA Queen using green goat lead with snap hook for handling her very well-behaved goat. Our writer, Joe, took the opportunity to sit down and chat with Sara's daughter, Brenda McArtor, who is the 2012–2013 Iowa Meat Goat Association Queen. Brenda is interning in Premier's Graphics Department this summer. The Iowa Meat Goat Association organizes activities of interest for meat goat owners and enthusiasts. As the IMGA queen, what are your responsibilities? Handing out ribbons at shows, and helping folks who are showing goats. You're heading off to Iowa State University this fall. What do you plan to study? I'm going into Graphic Design. I job-shadowed in the Premier Graphics Department last spring and am interning there this summer. No set course plan as of yet. What do you like most about goats? They have a personality. I had one that absolutely loved me. I would walk outside and it would jump out of the pen and follow me around. I had a collar and leash for it and would walk it like a dog. Dad eventually got tired of it coming up to the house and scratching at our door. What are the best and most trying parts of raising goats? Best part is going to the show (and winning)! The most trying—walking them. They're so stubborn and can decide to fall over after 2 steps. What won't your goats eat? They don't really eat everything, no trash or tin cans. Ours mostly eat grass, hay and feed. They'll eat thistles though. Any advice for folks just starting out with goats? Get along with them. They're more like pets than livestock. It helps to get into that mentality. We see a lot of different colors of Boer goats—what's your preferred coloring? I like the all red and the deep reds. They're very pretty and stand out from the mostly white goats. What's your favorite goat-based meal? What's your funniest goat story/experience? When we first started raising goats, we had "fainting" goats. My cousin and I walked out to the pen, and when she walked in they all fainted. She stood there in shock and said, "They fell over!" 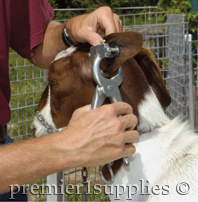 Many show goats are clipped once a month or more. So a clipper that’s quick, easy-to-use, won’t nick skin and leaves a smooth finish is an important tool. Clipper & blade advice—Use the 4000c clipping machine with the Fine, Medium or XtraCover blades. (Medium or Fine blades for close clipping; XtraCover if you wish to leave 1/4" of hair.) Use the Saphir cordless clipper (shown at right) for tight or hard to reach areas. Important: Because goat fiber is dry, apply oil to the teeth tips every 2 minutes (or less). But use only 3 drops of white oil at a time and wipe off any excess. Click on the video above to view our Trimming Stand assembly instructions. A goat can't be clipped the way a sheep can be shorn. That's where a trimming stand comes in handy. The stand restrains the goat during clipping, reducing the chance of the goat or the individual clipping from being knicked. For stubborn goats that refuse to climb onto the stand, use the ramp. • Rapid turnaround. When most of us need sharp gear, we needed it “yesterday.” So we sharpen most blades in 24 hours. (Allow an extra day in the hectic summer months.) Just fill out our resharpening form online and send us your blades. • Precision finish. Most large clipper blades are sharpened on automated machines. Beware: Blades can be damaged (and even ruined) during sharpening by those without proper machines or methods. • How good is our service? Good enough that we now sharpen over 50,000 blades, combs and cutters a year. This publication contains only a portion of the important information included on pesticide labels. Always read the product label carefully before buying and using any pesticide. Also, pesticide labels and registrations may change at any time. Any statements in this publication that disagree with the label must be disregarded. Many insecticides are sold under brand names that are not listed in this publication. No endorsement is intended for products mentioned, nor is criticism meant for products not listed. Infestations of fleeceworms or wool maggots usually start around the crotch in wool contaminated with feces and urine. Ordinary tagging and docking of animals generally prevents these infestations. Shear infested area and treat with an insecticide. To unsubscribe or change your e-mail address, please visit your profile page. If you know someone who would like to receive our newsletter, please use this link to forward a copy to them.